Brother Jesse Muhammad (BJ): How did you first get involved in social justice activism? When did you start becoming a writer? Jordan Flaherty (JF): I think I've been concerned about injustice ever since I was young, and I've been searching for ways to be involved and contribute in struggles for justice. As a white male, I've been aware for a long time about the various layers of privilege I have in this racist and sexist society, and I've wanted to find ways to challenge that. I think systemic oppression hurts all of us. I think that racism poisons the mind of those who benefit from white privilege, while also devastating our society as a whole. Patriarchy is a system that makes our world unjust and also destroys interpersonal relationships. Before Hurricane Katrina, I worked as a union organizer. When the storm hit, I was living in New Orleans, and I saw the city devastated before my eyes by a government that had failed on every level to protect its citizens. Then, when I evacuated a few days later, I saw how the people of New Orleans - especially African-Americans - were treated. I saw police and soldiers pointing guns at Black children. I saw families separated as they were placed on buses, with no information given on where the buses were going. This was a transformative experience for me, to see firsthand how this government was willing to treat people, especially if they were poor and Black. When I got out of New Orleans - to Houston - I saw how the people who had been victimized by this government were being demonized by the media. The survivors were being called "looters" and "criminals" and "thugs." So I wrote about what I had witnessed in the previous few days, and the New Orleans I had come to know in the few years before that. I wrote that as soon as I got to Houston, in just a couple hours, and sent it out as an email to friends. That email was later published and republished and translated into several languages and read around the world. People were hungry for information on what was really happening. After the article went out, I started getting feedback from organizers that I respected - in New Orleans and nationally - that this was something I could do that would be helpful. People were telling me that these stories of the disaster and of grassroots resistance needed to be told. People needed to hear that this was not a "natural" disaster, but a catastrophe that was caused by systemic injustice, and that played out along lines of race, class, and gender. So, I tried to take that direction from those who I respected so much for their wisdom and leadership in these struggles for justice. I tried to learn how to be journalist, one that is accountable to the truth, and also accountable to these communities. As I've tried to learn this craft, I remember the lessons of organizers from the Peoples Institute for Survival and Beyond, an anti-racist training organization based here in New Orleans. One of the things they say is, if you're trying to gain skills as an organizer, or a media-maker, and you're not also challenging racism, then you just become a more skillful racist. So I've tried to be very honest about the levels of privilege I bring, and the context that I operate in, of a racist society. BJ: Your book Floodlines is a phenomenal book. What inspired you to write it? JF: Thank you. I never thought I would write a book. However, I think that this post-Katrina experience is crucially important. This book is the product of five years of writing about these issues, almost a decade of living in New Orleans, and a lifetime of trying to learn from those who are leading these struggles. I think that whatever struggles you face, wherever you live, you can learn from New Orleans. Whether you work on housing, education, healthcare, criminal justice...if you look at New Orleans, we faced these issues on hyper speed. 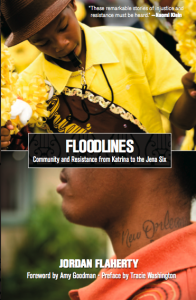 So there is an intense and terrible history of racism and white supremacy in New Orleans, but also an incredible history of resistance, and that is what I am trying to pay tribute to in Floodlines. These are the lessons I think anyone concerned with justice can learn from, and be inspired by. It's this resistance that inspired me to write this book. BJ: You take the reader on an intense journey from Hurricane Katrina to the case of The Jena Six. What is within these 320 pages that people may have missed or did not see on television? JF: Unfortunately, even when these stories make the headlines, the truth is rarely told. Our news media has such a short attention span, they rarely give the context for the news. Too many people think that civil rights victories in the 60s happened only because of Martin Luther King, Jr., or John F. Kennedy. This view of history ignores the hundreds of thousands who marched and protested and organized and built a movement. For example, I think we can all learn so much from the Jena Six families. Our movements should be proud of what happened in Jena. We should claim it as a success. Fifty thousand people marched in Jena, in a mass movement led by the family members of these six kids who were facing life in prison for a school fight. These Jena families didn’t have the corporate media behind them, they didn’t have money or mainstream civil rights organizations supporting them. All of that came eventually. But for months, these families were on their own, and they kept struggling and fighting for justice against incredible odds. Then they began receiving crucial support from allies like Millions More Movement and The Final Call Newspaper. Your reporting was crucial in getting this story out, and your work as an organizer, working with college students around the US, made the mass mobilization possible. The massive national support these courageous families brought together helped the students. All of them remained in school rather than going to prison – and they are all now either in college or on their way. Without the world watching, the DA and judge could have done whatever they wanted. Jena was more than a historical moment. I think that the young people from around the US – and especially the south – who traveled to Jena for the mass protests, and who also organized in solidarity in their own community, will continue to lead exciting struggles. I think we will see a Jena Generation. But the first step is in telling how this victory happened. BJ: What issues do you mostly focus on when you write? What issues are you presently zeroing on that we should be aware of? JF: I'm one of the editors of Left Turn Magazine, and I blog regularly at JusticeRoars.org, which is the website of the Louisiana Justice Institute, the organization directed by Tracie Washington. In addition, as a freelance journalist, my writing appears in local, national and international publications. I have also done reporting for places like the NYTimes and Al-Jazeera. But wherever I work, I've been continuing to try and document and support the inspiring resistance happening here. I hope people pay attention to the struggles of fishers on Louisiana's Gulf Coast, and community members in Jena. I want people to know that just because these stories have left the headlines, it doesn't mean that everything is ok in these communities. BJ: Last Fall, I was honored to speak alongside yourself and Victoria Law during the Community and Resistance Tour throughout the U.S. & Canada. Thanks again for the opportunity. We had a blast and an intense schedule. What was your aim in putting that tour together and do you think it was accomplished? JF: The Community and Resistance Tour was a group effort involving many organizations and individuals. We went to 25 cities in 25 days, and ultimately went to more than 50 cities over the course of three months - intense is right! One of the goals was to begin bridging grassroots media with grassroots movements, and to spread the word about movement successes. The tour brought performances, film screenings, poetry, workshops and discussions to communities across the United States and into Canada – from Atlanta, Ga., to Vancouver, British Columbia. Several thousand people saw the tour, with standing-room only crowds in several cities, and thousands more were reached via the extensive media coverage that the tour received. People were really excited to hear stories, like your inspiring and entertaining accounts of racial justice struggles in the south. For me, the most exciting aspect of the tour was the opportunity to connect with people across the United States engaged in vital movement building. We met with victims of police brutality in Pittsburgh, Palestine-solidarity activists in Montreal, and parents in a 24-hour-a-day sit-in for a library at their children’s school in Chicago. Everywhere we went, we found inspiring and exciting organizations struggling in innovative ways for justice and liberation. There is so much amazing resistance happening that never gets talked about in the corporate media. I'm so glad people like you, and tours like this, exist. Thank you for this, Brother Jesse!